Laing O’Rouke is a large UK based engineering company with offices and clients from across the globe. In 2014, they engaged Marshall E-learning to build a robust, blended learning solution capable of training over 4000 members of staff on the importance of Diversity and Inclusion in the workplace. The purpose of the training was to dovetail into their ‘People First’ campaign which sought to create an environment in which people could comfortably express their opinions regarding the remarks or behaviours they find unacceptable, where reasonable adjustments can be requested without any ill feeling, and where mutual respect is promoted. The core message of the campaign was that everyone must feel valued and included within the company. The course therefore had to tackle issues such as ageism, racism, gender bias and other types of stereotyping to ensure that staff members and sub-contractors could work in a comfortable, non prejudiced environment. The challenge facing Marshall E-learning was that the course had to take into consideration the many different learning styles within the organisation, in a manner that would not only educate but entertain. With the course rolling out to time-pressured managers from varied departments such as HR though to site services and suppliers, the learning program would have to be suitable for everyone and take into consideration the different learning environments. The agreed learning solution was to take a three pronged approach. 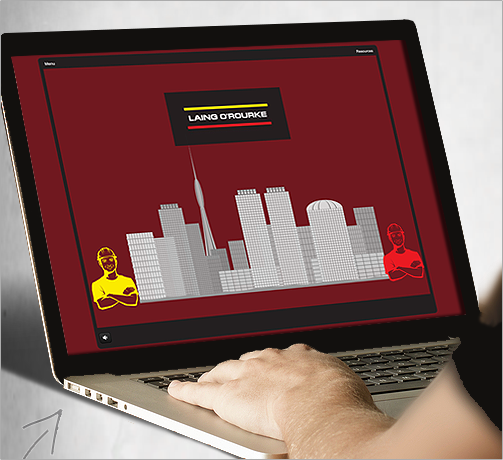 Marshall E-learning would produce an elearning package, a face-to-face training module and a standalone e-learning module for suppliers and sub-contractors who are unable to access the Laing O’Rouke IT systems. By using these separate training mediums, Marshall E-learning was able to maximize the learning potential across the teams and provide relevant examples from each department, where issues impacting Equality and Diversity may manifest in different guises. The e-learning package would include lots of different types of interactions and thought provoking scenarios to challenge employees to think differently about the way they communicate with each other. By including a design that is HTML5 compatible, the course could also be used on site using mobile devices if required. Take a look at Marshall E-Learning’s Diversity in the Workplace course or contact us to find out more about how we can help fulfil your training and development needs.